For its last year - July 2013 to July 2014 - the library and its users were supported by www.GarberLibrary.org. Though that website is no longer active, its Home, History and Virtual Tour pages have been saved here. Shown below is a full size image of the website's Home page. When the above image was captured in June 2014 the background of the Home page had just been changed from gray to purple to honor the memory of six year old Rebecca Meyer. Editing these Cleveland Jewish history pages made me a frequent user of the library and of the pages it had on the website of the Siegal College of Jewish Studies. The pages (see menu at the right) had links to its catalog, OhioLINK and the online 2007 Encyclopaedia Judaica, a page on the Friends, and more. In June 2013, with the college closed, its adult education programs now part of Siegal Lifelong Learning at Case Western Reserve University and supported by a new site (SiegalLifelongLearning.org), the old website (Siegal.edu) went offline. Almost overnight the library lost its web presence. A search would find links to the old Siegal College pages, but clicking on those links would show "page not found" errors. 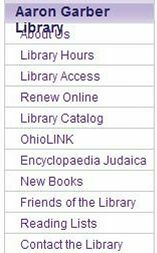 Though the Jewish Education Center of Cleveland had taken responsibility for the library more than a year earlier (CJN, February 3, 2012), it had not created web pages for the library. Contacting the JECC revealed that they had no plans to add web pages for support of the library. 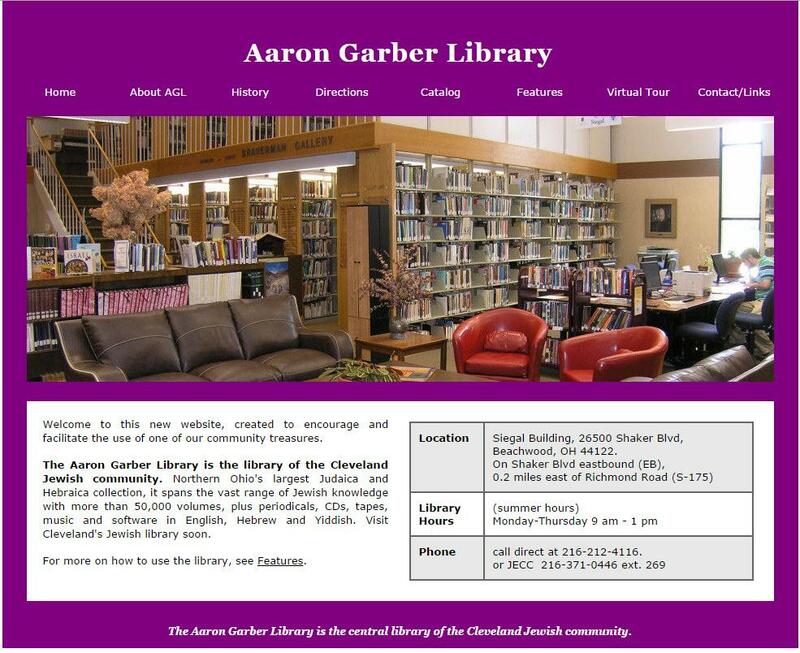 In July 2013, believing that awareness of and use of the library would decline further without web pages supporting it, I registered the name GarberLibrary.org and created a website. The JECC and Access Jewish Cleveland agreed to link to it, and soon did. A year later, in July 2014, knowing that the library's closing was near, I did not renew its domain name. The website's end went unnoticed, as had its start, but I had done what I could.